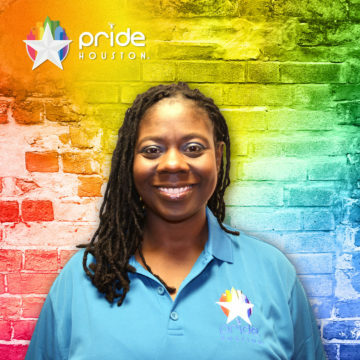 Kendra Walker – Pride Houston, Inc.
Passionista. Member of Alpha Kappa Alpha Sorority. Lover of humans, dolphins, purple and Patron! Software analyst with two decades of IT experience doubling as an event curator who wants to live in a world filled with innovation, books that come bundled with wine and high heel shoes so comfortable you can run in them. Business owner (Intellichoice Consulting and Lesbians Of Color), travel girl and all-around boss. Mom of one and friend to many. “When I’m not running around like a crazy mad woman, you can find me home watching a Good Times or Law & Order SVU marathon intensely even though I know how each episode ends already. In my spare time, I like to convince people to let go and have a good time, collecting vaults of unforgettable moments and inspiring others to be the best version of themselves.